I spotted Squinternet Larnia wearing this gorgeous big and fluffy hairstyle on her Flickr stream, and I had to have it! Anessa Stine was kind enough to drop me a landmark to the hair shop in-world, and I spent a good bit of L’s buying some crazy wigs. Yes to me, these are not actual “hairstyles” but more like wigs you would wear with costumes. The hair shop is called MrS – normally I laugh at hair like this, but I really wanted this style. Most of the hairstyles at that shop were terrible cos they were full bright, with flickering flexi-prims, and just kind of cheap looking but that was exactly why I liked the two wigs I got — they looked like tacky fun wigs. I am wearing two incredible new Donna Flora releases. The Wave dress & Bambola dress, both have gorgeous textures & sculpted pieces. The Bambola dress also includes a gorgeous butterfly shaped hair bow. 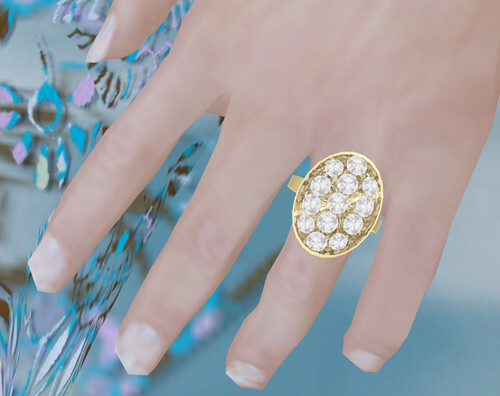 A few days ago I read somewhere that fans of Twilight could purchase Bella’s engagement ring so I really wanted one in SL! Thankfully, Caroline Apollo was already one step ahead of me and released this ring ages ago. Visit Caroline’s, if you want Bella’s ring! I cannot WAIT to get my hands on those Lola skins, looks like my favorite release from Lelutka so far, pending personal inspection! SSOOOOO excited about tattoo makeup options! thank you gogo for blogging! Amadeus eat ur heart out. Fabulous! MrS is extremely generous should you ever need to dress up a brand new alt. AOs, hair and several old skin packs for free. That’s really awesome.